Last week, from 12.05. 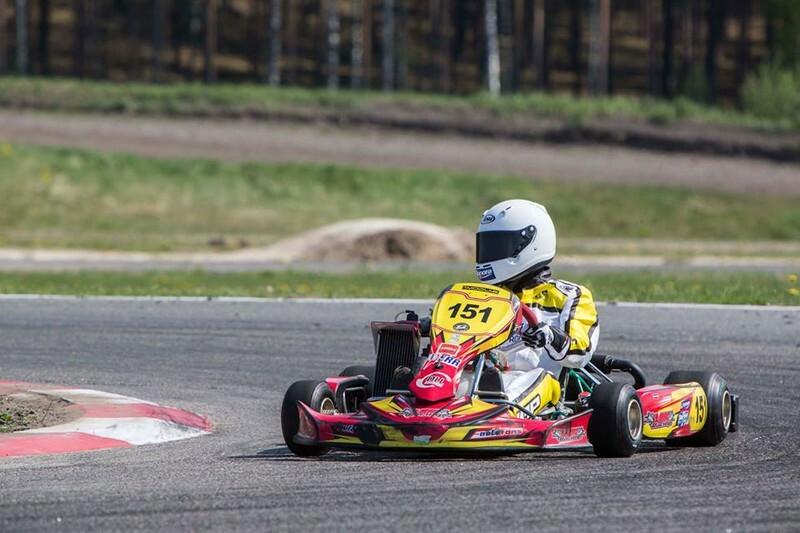 - 15.05. in Belgium, Genk took place the International Automobile Federation Karting Commission (CIK-FIA) Karting Academy 1st stage. Latvian Autombile federation to these prestigious competitions this year decided to send talented and quick rider Gustavs Māliņš. Gustavs showed very good results in training, qualification and also in heets, but some mistakes in overall refused to get into the final. Gustavs in the race was the only Latvian representative. While the Baltic States, apart from Gustavs, the race was still represented by a rider from Estonia, who also did not qualified for the finals and unfortunately remained one point behind Gustavs. CIK-FIA Karting Academy is unique in that all participants Karting Academy starts with one manufacturer's equipment. Throughout the event with the engines it has to change. The fastest riders are exchanged slower riders engines and vice versa. This means that competition in the fight for victory is made similar to the maximum, because the winner will determine the driver's talent, his skill to regulate the technique according to the track characteristics and athlete's requirements. Athletes age - from 12 to 15 years. After the race comments from Gustava Māliņa coach and mechanic Dainis Safonovs: "The event was well organized. 52 participants from all over the world - Brazil, Chile, Mozambique, of course, also participants from Europe and Scandinavia. A lot of riders and strong competitors. In general, we went pretty well, lap times were good. Trainings were inside the Top 10 riders. At heets bit unlucky - small accident, small penalty and stayed at the end of the first after the final lines. Heet first dual on 8th position, but we got a penalty for front bumper, so the 20th place. The second heett was the 8th place and the third heet, the very at the start was a big crash, which also took part Gustavs unfortunately. In this competition, unlike the others, kartings are not clutch and are pushed and if the karting somewhere cutting or stops, you can not continue the race. All three heets has collected the least possible point, we gathered just 1 point more, we denied the opportunity to be in the final. Overall, we were very willing and fast, but this time just unlucky. " Gustavs himself is quite confident and believes that the finals can be brought into the Top 10 or even Top 5 and have the glory of fighting with the leaders, but unlucky with the penetration of crashes and inability to avoid penalties. Gustavs is currently focused and going to the next stages of the Academy. "At this stage, certainly I got the experience and realized that the faster drive the qualification drive"says Gustavs. The next stage will take place from 2.07. to 5.07., In France, Le Mans. By then Gustavs and his team have a lot of time to prepare and improve their performance, to the satisfaction of the next stage would be much higher. Meanwhile, we will certainly let us reason together thumbs and report on future Gustava Māliņa launches and results!